Innovative technology developed by University of New Brunswick (UNB) researchers is helping NB Power create green energy solutions for the province. 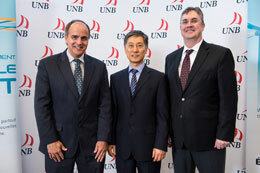 The partnership between NB Power and UNB is pioneering industry-leading wind forecasting research created by UNB Professor Dr. Liuchen Chang. This forecasting will identify the best opportunities to use wind energy in homes and businesses. Nearly 1200 customers from around the Maritimes are already piloting intelligent technology that helps NB Power incorporate that forecasted wind onto the grid, maximizing the potential of a renewable resource known for its intermittent challenges. The project is allowing heating and cooling systems at the Wu Conference Centre on the university’s Fredericton campus to be powered by wind energy. This technology pilot is part of an international award-winning project led by NB Power called Powershift Atlantic. PowerShift Atlantic was launched in 2010 as part of the Government of Canada’s Clean Energy Fund. It is a collaborative research project led in partnership by NB Power, Natural Resources Canada, Saint John Energy, Maritime Electric, Nova Scotia Power, New Brunswick System Operator, the University of New Brunswick, the Government of New Brunswick and the Government of Prince Edward Island. The research portion of the program is expected to wrap up in the fall after a full year of piloting this technology is complete. Once this is complete, NB Power will be able to use this data to determine if a business case is possible to introduce new products and services to New Brunswickers that utilize wind power. Dr. Liuchen Chang teaches and researches in UNB's department of electrical and computer engineering. He is the National Science and Engineering Research Council Chair of Environmental Design Engineering. Please contact Kelsey Seymour to arrange a media interview.